‘Since 1971, U.S. citizens have been able to utilize Federal Reserve Notes as the only form of money that for the first time had no currency with any gold or silver backing. This is where you get the saying that U.S. dollars are backed by the “full faith and credit” of the U.S. Government. In other words, Nixon implied; take our paper dollars or don’t’. It can’t be often that a concise and illuminating illustration of the nature of money pops up in the nexus between tattoos and professional sports. Once in a blue moon perhaps. Nevertheless…. Money is a contract- a set of words and images that embodies a decree. (This is the decree gold and silver bugs get confused about when they refer to fiat money). This decree element is a vital component of a money contract. It decrees the economic environment for the life of the money contract. This decree is expressed in the central bank interest rate in respect of that specific contract. This contract is mounted on a transferable medium. Something that can be securely transferred from one owner to another. The contract is issued by the relevant legal authority– which is the body authorised to mount that specific proclamation upon that specific transferable medium. The validity of a money contract depends on the extent to which it decrees the nature of the real economy. The ‘value’ of that money contract is an expression of its validity. In other words: The money contract is valid to the extent that it decrees the nature of the real economy. Not ‘reflects’ the nature of the economy, decrees it. It is valuable to the extent it is valid. This comprehensively defines the value of money. 5. A money decree is valid to the extent that everyone complies with the terms of the decree it embodies. It follows from this that a money decree is valuable to the extent that everyone complies with it. 6. A money decree is complied with to the extent that the money contracts issued compare with the amount of economic activity undertaken for the same territory and time span. Which brings us to Kentucky Wildcats fan Rock Wright and his tattooed leg. What is fascinating about Rock’s tattoo (and his leg to a lesser extent..) is that it functions more or less the same way as money. In fact, Rock has sort of turned himself into a piece of money! Money is a contract- a set of words and images that embodies a decree. (This is the decree ‘insurgents’ get confused about when they refer to fiat money).This decree element is a vital component of a money contract. It decrees the economic environment for the life of the money contract. This decree is expressed in the central bank interest rate in respect of that specific contract. Rock, (the legal issuing authority*) has created a tattoo that makes a clear decree about what the future sports environment (economy,)will be. The subject of the decree is the activity of the Kentucky wildcats. The environment,(economy), the Wildcats are operating in is the Championship league. The term of the decree is up until the championship concludes with one winner which will be the Wildcats at which time Rocks money/tattoo will be retired as a decree and become a record. *Rock is both the medium and the issuing authority as he owns his own body and can do with it what he likes.. Since this is the case, he has control over his body and what gets tattooed on it -at least for now…. 4.The validity of a money contract depends on the extent to which it is corresponds to the real economy. The value of that contract is an expression of its validity. It is valid to the extent that it corresponds to reality. It is valuable to the extent it is valid. The validity of Rocks tattoo should be fairly obvious. If the Wildcats get spayed in the championships neither the tattoo or Rock himself is going to look too smart to anyone who sees them. If Rocks decree comes off he looks like a pretty cool, smart guy (at least to some people), if it goes wrong, well Rock has got a plan for that too. Rock has got ‘faith’ in the Wildats and gives them ‘full credit’. A money decree is valid to the extent that everyone complies it.A money is decree is complied with to the extent of the amount of contracts issued compared with the amount of economic activity undertaken. Because only Rock has got a Wildcat tattoo decreeing 40-0, the tattoo and the decree don’t look too good to most people right now- faith is medium to low. But if every fan in the league as well as every member of every team (including the Wildcats opponents!!) had a tattoo like Rock, a Wildcat Championship victory would be a shoe in. A self fulfilling prophecy. The decree would be ubiquitous and in full force. Just like successful, valuable money is in any given territory. ‘We still like Wright’s odds more than Tyler Black’s. Now that we have more than one money decree tattoo, we can start to build up a history of ‘Wildcat Tattoo Money’. Comparing the relative validity of each tattoo while at the same time taking them in their totality means we can build up a picture of this currency over time. Just like we can with ordinary currency. 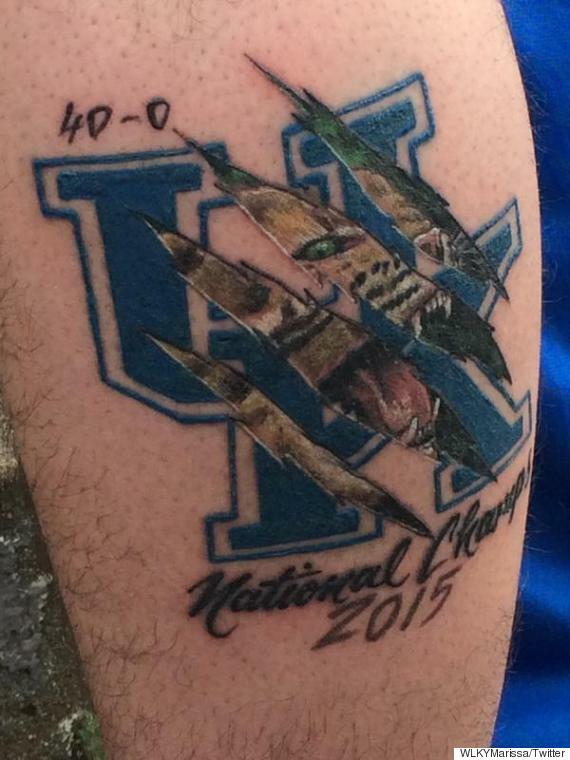 And if everyone in Kentucky had a tattoo for every season…. I have argued (in a different context), that the second world war ended not with the declaration of VE day or VJ day, but with the fall of the Berlin Wall forty or so years later. Challenging the date of victory challenges an entire perspective on the meaning of the Second World War. Your perspective on the Second World War rests on understanding the objectives of each side and to what extent each side achieved those objectives. In other words understanding objectives is a necessary part of understanding what constitutes victory. The Victors in the second world war did not achieve all their objectives on VE day or VJ day, that only happened with the re-emergence of a reunified Germany. The Saxon elite fought a long, silent war to achieve the reunification of Germany for forty years after the official cessation of hostilities. This might lead you to ask who the real enemy was…. The same is true with the Battle Of The Credit Crunch. We are coming closer to a declaration of victory and the announcement of a victory parade. As far as the mainstream economic data coming out of America and Britain goes, the Saxon team is on the home straight. We are informed that unemployment is falling. Economic growth is (sort of), gaining traction. Compared to the basket case that is the rest of the world economy, things are not too bad, Saxon elites lay claim to some kind of normalisation in Britain and the USA. And so it is reliably reported, interest rates are going to move upward towards the ‘new normal’. Note that ‘new normal’; it is important. But first, take a quick look at the crowd behind the barriers as the great and good prepare for their triumphant circuit. Hoots of derision and catcalls greet the declaration that Fed interest rates will rise- after all haven’t we heard this over and over the past decade? Why will now be any different? These catcalls are at least in part, justified. The hoi polloi have noted that whenever one of the floats breaks down or a bit player falls over while executing a tumble, a rain of digital ticker tape money descends from the skies distracting the attention.. This parade still isn’t really going anywhere they argue, so how can they do without the free Federal Reserve supplied ticker tape? That an economic collapse will come. There are not many still pushing this line outside a dedicated few on the libertarian wing of economics. And when a collapse of some kind is predicted, it tends to be focused on an outside factor such as war with Russia. That interest rates will stay low or even fall further because the financial system cannot afford to see them rise- this is because modern finance is in essence a Ponzi scheme that needs a constant influx of free money from the government. Increasingly there is a new twist in the discussion on low interest, the international blowback element. The argument here is that raising interest rates in the USA will screw the world economy and therefore America will come under increasing pressure will stop this happening. 3.Interest rates will rise to a new normal interest rate (see Guardian article). Discounting the possibility of outright collapse, I would argue that the stay low or go lower faction is missing an important trick. Since they don’t believe interest rises are possible, they don’t analyse the proposed extent of any possible rise. This is a major error because insight into the specific target rate that central banks are seeking to achieve gives real insight into their thinking. The new figure for a target interest rate is given in the Guardian article as 2.75%-3 %. What would an achieved rate of 2.75% or 3% actually mean for the Saxon elite? It would mean that they had achieved the real objective of the Credit Crunch war; to secure a permanent, secure position for Democratised privately issued money in the form of derivatives in the world economy. Since the interest rate is an expression of the total state money economy, it follows from this that 2.5%, half the long term average rate,would represent half the traditional post war American economy given over to democratised money. 3%, which is 60% of the long term interest rate average, would represent 60% of American economic activity denominated by the American state and 40% given over to democratised money. By way of comparison what would it mean if central bank interest rates in Eurozone or Japan stay low? This would reflect the extent to which these respective economies have been supplanted by derivatives. The lower the interest rate, the higher the proprtion of your economy that has been leached to derivatives. The derivatives/state money balance is expressed through the ‘health’ or otherwise of the banks. One of the key mistakes the economic ‘insurgents’ make is to confuse the defence of democratised money with the defence of banks and bankers. Since the banks and financial institutions are the purveyors of democratised money, they are inevitably saved alongside the democratised money they produce. But this does not mean that this was the prime intention of Monetarist politicians in implementing QE. This is a perfect example of needing to understand the real objectives in a war before you can understand the meaning of defeat or victory. The specific crisis that sparked the Credit Crunch was a failure in interbank lending. Financial institutions did not want to make temporary loans of state money to each other because they feared the massive and unknown amounts of derivatives that they all carried on their books. This was effectively admitting that there was a possibility that the value of these derivatives was heading towards zero.. But this was never a liquidity problem. This was an exchange rate problem between the value of state issued money and privately issued democratised money. The problem was that democratised money was effectively worth nothing compared to state issued money. Bought these derivatives at their maximum possible denominated value using state money. This is exactly the same as a central bank intervening in currency markets to lower the value of your own currency while propping up the value of another currency (democratised money). I do believe that there were a number of politicians who genuinely believed that there was a possibility that this sabotaged money could have gone into the national economy. And of course when it became clear that this was not happening they asked the question: Why not? Faced with this question the useful fools folded and chose repair the credit crunch. It meant that wealth extracting opportunities in Britain and America were competing with wealth extracting opportunities anywhere in the world for this QE money. The Monetarists has succeeded beyond their wildest dreams. They had ripped off the cover from Anglo Saxon economic society and exposed it completely to the winds of international competition! And when did Anglo Saxon society begin to ‘recover’? When it began to compete with the terms and conditions and profitability of the most exploited parts of the world. So you have a recovery for the monetary system but no recovery for you…. A hyper victory for Globalisation. And how can Japan and Europe recover? By doing exactly the same thing. And why haven’t they ‘recovered’ yet? Because they are still trying to hang on to the shreds of their respective societies. But we have got Abenomics and we have got ECB QE so it won’t be long…. So the Saxon economies become more profitable in comparison to the global economy so the QE cash returns ‘home’. So the overseas economies enter a period of crisis because of the withdrawal of QE liquidity, so their terms and conditions have to fall, which draws the hot cash back to their economies, which means our economies are less competitive by comparison, which means another attack on our terms and conditions. And they expect you to stand there in the rain clapping and cheering as they march past…..
For it seems to me that God has put us apostles on display at the end of the procession, like those condemned to die in the arena. We have been made a spectacle to the whole universe, to angels as well as to human beings. probably via Dave Harrison @ TradeWIth Dave who contributes significantly to our overall understanding of new forms of money as they appear and evolve. Despite the wise injunction not to ‘Listen at doors…’ I nevertheless proceeded to absorb and then respond to the comments I found there. I am always keen to discuss my analysis since this is the best way I know to develop and deepen my own understanding of the Democratisation Of Money. Furthermore I am always in favour of the most robust kind of discussion on the basis of the premise that it is impossible to edge a knife on a block of butter. If you really want to sharpen your understanding sparks must fly! The whole thread became increasingly unwieldy so I am anable to reproduce it in any kind of coherent order here. Obviously, you can see it all at the address above. I have dealt with the points I think are most illuminating. I have put the points in bulleted quotation marks and my answers in italics. Money is not paper or gold or anything else, it is a legal instrument recorded on a transferable object. Nothing is money until it is designated as such by the relevant legal authority. The mortgage on you house is written on paper, does that mean it is worthless because the paper is worthless? What nonsense! The value comes from what is printed on the piece of paper, not the paper itself. What do Capitalists claim Capital is then? What do Capitalists Capitalism is then? What do Capitalists claim mean by ’ investment’? What do Capitalists mean by ‘return on investment’? Even in its simplest terms, this statement is plainly self contradictory. How can wealth ‘circulate’ unless it is extracted from one place so it can be ‘circulated’ to another? In what form can wealth ‘circulate’ if not in the form of money? What do you understand by the term ‘accountancy’? What do you think accounts are for? What do you imagine the difference is between ‘currency’ and ‘money’? Define this difference. If you know of any valid legal difference in the definition of currency and money please explain it. I used the term money specifically and advisedly. Gold can be used as money, but so can shells, pieces of paper etc. Money is a legal instrument. (see above). Aeroplane windows are irrelevant. But in a free society there’s no way to limit that. I don’t have to accept your money, I can pick any of several private currencies or forms of money that circulate around. -(?) For some reason you have been unable to finish this sentence- were you confused? What did you mean to say? This is simply wrong: You do have to accept my money in settlement of debt, legally ordered payments, in payment of taxes etc etc . Look up the meaning of ‘legal tender’. The government has mandated this. Your statement is evidence of painful ignorance. “If there were an infinite number of possible profitable ways to utilise money what would the effect be on interest rates? Despite the fact that there would be little or no risk, interest rates would be high. They’d be high because there’s more demand relative to supply. Money is supposed to be scarce, otherwise it’d be worthless or close to worthless and people would not want to hold on to it (or denominate their labour or products/services in it). This does not in any way refute the point that interest rates are a product of demand, not risk; in fact you simply restate the first part of my point, albeit in a somewhat less elegant way. “And what would be the effect of an opposite environment of high risk and few profitable ways to utilise money? Then interest rates would be low because there would be little or no demand for money.I’m not sure this dual (high risk + few profitable ways to utilize it) hypothetical setup is valid. Really? Because that is the setup we are in right now! If risk is high, interest will be high. That’s regardless of how one wants to utilize money. If there are few investing opportunities, interest rates would be low because of a relative lack of demand. You try to characterise ‘risk’ as some invisible abstract force of nature that cannot be located within concrete tangible reality. By conflating risk and interest you hope to glide past their supposed relationship: ‘If risk is high, interest will be high’. is a statement of religious faith dressed up as economics. There is no risk outside of investment opportunitiesor the lack of them. If there is, show me where it is! Currently in the world there is too much capacity in most industries worldwide, so consequently although risk is small, there’s no demand for money (actually individual currencies, but since you didn’t make this distinction I’m playing along) simply because building another steel mill is likely to make that debt bad (i.e. you won’t make money from it). ‘Currently in the world there is too much capacity in most industries worldwide’ Another meaningless generalisation! Raw material producing industries and finished commodity industries to say nothing of services, cannot be lumped together in this way. Interesting, but he doesn’t address the effect of inflation and deflation. In a deflationary period the value of money increases, so despite ZIRP/NIRP, which doesn’t increase the nominal value of a particular amount of money, the “real” value still increases over time through deflation. I think that undermines his entire argument? At least, if the deflation fully compensates the decrease in interest rate, then it does. This goes right to the heart of my argument, which I am afraid you haven’t really understood. You cite the beneficial effects of deflation on the value of money as a way of offsetting the non-beneficial effects of ZIRP. You argue that in theory at least, deflation and ZIRP could effectively’ net-out’, meaning that there would be no losers in a system which would be in your terms, self regulating. The first and most obvious problem with this is that it is highly unlikely that the people who are disadvantaged by ZIRP are the people who would be advantaged TO EXACTLY THE SAME EXTENT by deflation. When I put it in these terms I am sure you can see what I mean. In other words, if you are getting no interest on your savings, you are told you must take the money out of the bank and buy a boat with it, why?- because you will save a lot of money! But what happens if you don’t want to buy a boat? From this it should be clear that even if ZIRP/Deflation could by some stretch of the imagination be described as OVERALL neutral, it has to be admitted that it causes massive wealth transfers from individuals within the system. Because it effects different MONEY FUNCTIONS differently. Deflation and Inflation are in no sense ‘real, they are estimations based on aggregated information produced by governments. They are primarily political tools. I am sure you are aware that the methodology for calculating inflation/deflation figures has been regularly amended in every major economy, usually to suit the political requirements of the time. There is no clear, real and genuine way to calculate deflation, so the idea that this misty, indeterminate figure from the future can be used to offset the very real concrete lack of interest from today is a bit of a stretch…. The third problem is the main one I was trying to describe and it flows from the above two points I have made. You are describing monetary policy as a totality which is to say, you are concerned with the TOTAL amount of money netted out. But money is not like that. It is not a single contract that comes to maturity and is then paid out. Money is constantly being issued and retired, there is never a time when it is accounted for in totality. The amount of money and the ‘real’ value it represents is a constantly moving target. So there will never be a time when it will be possible to say what the discrete outcome of any action will be. The only way to understand money is as a series of ‘waves’ of contracts and the effect that these contracts have IMMEDIATELY. The effect of the money issued during the credit crunch was to save the lives of the banks. It does not matter what the ‘real’ value of this money was, in terms of the banks or the overall economy, without it the banks would have died. Just like a billionaire would die in the desert without a single bottle of water to keep him alive. Money is not a totality- it is a collection of functions. Money can most usefully be understood as a collection of functions. Functions are the possible uses that something can be put to if you should so choose. You can use a knife to cut cheese or spread butter, they are two different uses of the same implement. The design of an object determines what its possible functions are. It is possible for the creator of an object to enhance or limit the functionality of any given object by altering the design of that object. If you were to make a hammer out of glass instead of hardened steel it would considerably limit its function to hammer nails! At the same time it is possible for users of an object to take advantage of, or modify the functionality of an object in ways that were not approved of or foreseen by the creators of that object. A car can be used to carry out a bank robbery or to knock down a tree, neither of which was it expressly designed for. It follows from this that the total functionality of an object is the nexus of purposes between the creators of that object and the users of that object. Money is no different from any other manufactured object in this respect. The creator of any given piece of money is in the last resort, the government. This is specifically because any piece of money is a legal instrument. Money is nothing other than a legal instrument, nor can it ever be anything else. It follows from this that the functions prescribed for a piece of money by its creators are limited and defined by law. Money has no significance outside of these legal limitations. So for example you cannot use money to legally buy another human being. It does not matter even if somebody freely wants to sell himself to you, such a function of money is not permissible. No such agreement would be legally enforceable. Further, this invalidity is not limited by the amount of money involved in such a transaction. There is no amount of money you can offer for a person that would make such a deal a ‘fair exchange’. This is a simple legal limitation of money. But money is not only defined by the limitations on its use, but by the positive functionality it offers to its users. This positive functionality means that in some real sense, the use of money is entirely voluntary. If any given government cannot provide a legal framework of functionality that serves the interests of the users of that money, then they rapidly turn to alternatives. Money is a way of channeling and controlling trade, but where any particular instance of money fails, trade finds a way. Trade (as human interaction) is ubiquitous, like air and light. Which brings us to interest rates. Earning interest is – was, a positive function of modern money, that is to say it is a positive reason why people wanted the kind of money that is available now. Interest is validated as an expression of the contemporary social value of money in terms of itself. In other words, interest on money is paid in money to express its value at that specific time. This additional money that accrues to owners of money by virtue of possession expresses the fact that money is valuable. Interest proclaims that all things being equal, anyone within society should/will be able to use money to extract value. It is a license, a legal permit, to extract value from within the society. ‘Extract’ value is important, as you will see in a minute. This definition of interest is of central importance because it contains within it a model of the society into which the created money will go. It makes plain that there WILL be opportunities to use money profitably (in a way which can extract value), within the given society. It follows from this that the interest function is in essence a statement about a given society. And it is fundamental to the way that modern capitalist societies differ from pre capitalist (‘feudal’) ones. Modern capitalist societies will offer opportunities for wealth extraction/ transfer, non capitalist societies do not guarantee this. This is the fundamental rhetoric and ideology of capitalism. From this positive functionality of opportunity an apparent negative functionality is implied: That it is possible that there might be limited or no opportunity of profitable use that can be made of a given amount of money. This possibility is defined as ‘risk’. If there were an infinite number of possible profitable ways to utilise money what would the effect be on interest rates? Despite the fact that there would be little or no risk, interest rates would be high. Because there would be high demand for money After all, what would incentivise the lending out money when there were countless easy ways to directly invest it at high returns? And what would be the effect of an opposite environment of high risk and few profitable ways to utilise money? Then interest rates would be low because there would be little or no demand for money. In this environment, investment opportunities as opposed to money would be at a premium. This directly refutes the idea that interest is an expression of risk. It is precisely the opposite. The amount of interest charged is NOT a reflection of risk it is a reflection of the lack of risk. Further it directly refutes the idea that money produces wealth. Money extracts wealth from profitable opportunities. Without these profitable opportunities money is worthless. As I argued above, interest is a statement about a society. So what does the MONETARIST refusal to obtain interest from the money they issue- ‘ZIRP’, say about society now? It says that there will be no ways to profitably extract wealth. It is effectively the end of a capitalist society. It is worth unravelling this. I argued that money is a designed artefact. I argued that money is a legal instrument. It follows from this that the production of money is a legal process. The charging of interest by central banks when money is issued is part of this legal production process. Money that is designed to be produced without this initial interest charging process is designed to be different from money that is produced with interest charging. It is designed to be a different kind of money. It is a different kind of money. It has effectively been sabotaged, in the same way that a hammer that has not been sufficiently hardened has been sabotaged. To return to the hammer analogy, the total number of hammers being produced might be the same or even increased. But the quality of the hammers being produced has been diminished. The overall stock of hammers is being progressively corrupted as useful hammers are retired and replaced with ‘semi hammers’. What this means is that it becomes progressively harder to find a useful hammer to knock nails in with. Doesn’t this correspond to what you have seen in the real economy? Despite the fact that there has been a record production of money, activity in the real economy is actually shrinking- how else can the deflation we have seen be explained? How else to explain phenomena like stock ‘buy-backs’ where management use cheap ‘money’ to buy back their own company shares and boost value by increasing the earnings ratio. This is effectively turning shares into a kind of money surrogate. The explanation for this is that when there are no useful hammers to be found, you are forced to improvise an alternative, (the back of an axe head for example) to knock a nail in. This would be a surrogate hammer, and now since there is less and less useful money around, shares are being used as surrogate money. ‘To a man with a hammer, everything starts to look like a nail’. But to a man with a nail to knock in, quite a few things can start to look like a hammer. The sea exists over space and time. But the sea is not a totality. The action of the sea is a collection of waves over time. The waves vary in size, shape and force over time. You are encouraged to see money as a totality, but in fact it is a series of legal instruments, that differ in design over time. The interest rate is one of the characteristics that can vary. Monetarism has built a series of wave breaks and artificial reefs that systematically change the size and shape of the waves that break upon the shoreline. And these modified waves of money issuance are being used to smash up the coastline you have known. It is deliberate systematic human intervention.